There was a severe storm last night here on the coast. Heavy rains and wind strong enough to blow over herb pots and topple lawn chairs. Today there is an all-day high surf advisory which means higher than normal waves, lots of sneaker waves coming high up on the beach and riptides. Dangerous conditions. 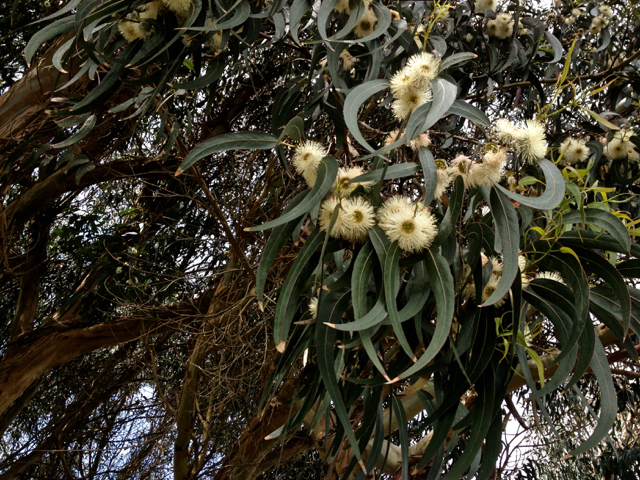 In between rain squalls I got out to admire our local giant Eucalyptus tree. It is in bloom now with an extra dreamy scent of freshness. I am very fond of the Eucalyptus. On coastal drives I love to roll down the car windows and breathe deeply of its heavenly essence. Thanks for those pictures. I never saw blooms on those tree before. Beautiful! I love the title “Tin Can Traveler”!